There are numerous fragmented RBC's seen here. Some of the irregular shapes appear as "helmet" cells. 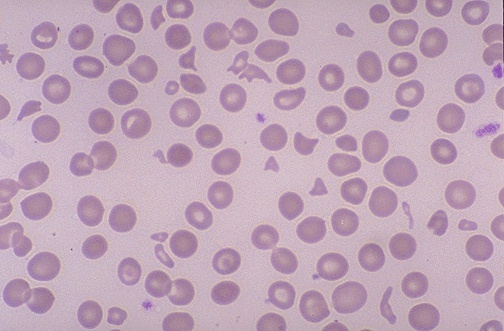 Such fragmented RBC's are known as "schistocytes" and they are indicative of a microangiopathic hemolytic anemia (MAHA) or other cause for intravascular hemolysis. This finding is typical for disseminated intravascular coagulopathy (DIC). Which of the following laboratory tests is most specific for this condition?